Comprehensive information about our partners’ products and services can be found on their respective trade websites. Travel agents may have to register for access to the websites. Please see below for further information and links to our partners trade websites. 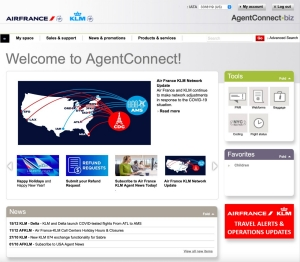 AgentConnect.biz is the Air France and KLM dedicated website for travel agents. Please click on the logo below to access the site. Sales & Support – Here you can find information to best serve your customer including policies & procedures, passenger assistance, and fares & ticketing information. News & Promotions – Stay up to date with news and schedule changes. Products & Services – Find latest information on network, on board services, and loyalty opportunities for the traveler and your company. 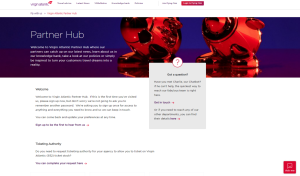 vsflyinghub is the knowledge hub for the travel trade from Virgin Atlantic. Please click on the logo below to access the site. Library – Here’s where you can access all the photos, logos and copy blocks you need to create your own communications. News – Read up on the latest news from Virgin Atlantic and Delta. Training - Become a certified Virgin Atlantic whiz kid with our fun, easy to complete training modules. They’re packed full of really useful information about all of our products and services, and they make selling us to your customers much simpler. Offers – Here you’ll find our active travel agent incentives, competitions and best of all, the prizes you can win! 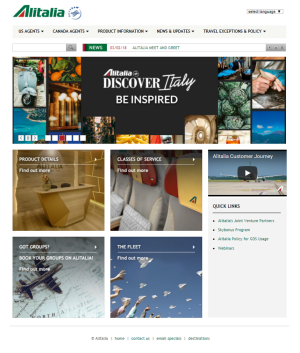 Alitalia Agent is Alitalia's website for travel agents. Please click on the logo below to access the site.